(In Photo) L to R: Mr. Patrick Tan, COO of SEAIR International, Ms. Delza Gochoco, President and General Manager of Triplestar Travel and Tours, Mr. Charles L. Lhuillier, MLFSI Executive Vice President and Ms. Clairene C. Umali, MLFSI Insurance & Special Products Division Manager. Muranglipad.com announces its partnership with M Lhuillier Financial Services, Inc. (MLFSI) to accept cash payments for air ticket issuances. Muranglipad.com, a division of Triplestar Travel and Tours, Inc., is an online budget travel portal that provides airfare comparison and real time ticketing for all airlines to all domestic and international destinations. With this partnership, clients can now enjoy expert travel advice online from Muranglipad.com’s website, or through its pool of travel specialists through its reservations hotline at +63 (2) 849-0100, 8:00 AM to 8:00 PM, Mondays to Fridays, and 9:00 AM to 6:00 PM Saturdays and Sundays, and the convenience of paying their booked air tickets through any of the 1,600 M Lhuillier locations nationwide, with almost 160 locations operating 24/7. 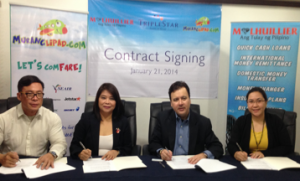 To find out more about the new and exciting services, you may visit MurangLipad.com, any of Triplestar’s ticketing offices nationwide, and M Lhuillier’s website at www.mlhuillier.com.